You've taken the time to sit down and get the thing written. You've figured out how to make a good looking, informative blog post and you got all the way through the writing and re-sizing of your images and your are ready to hit publish. But now that you are LIVE on the internet....what do you do next? How do you get this amazing content in front of peoples eyes in a way that isn't consistently screaming...look at me, look at me!!! Everything that goes along with sharing content that you have created starts with mindset. If you are in the wrong or misguided headspace around WHY you are sharing what you are sharing, it all becomes much more difficult. We are typically our on worst enemies. If you don't already have a blog strategy...I would suggest hitting up The Blog Better Bundle and grabbing my worksheet on how to create one. Having a strategy to begin with will not only help you create more and better content but it will take the ick factor out of sharing your content with the world. Once we have our mindset straight, let's think through sharing our newly crafted and published content from a timing perspective. You have a few options when it comes to sharing. Sharing the content after you publish (days, weeks or even months after). Depending on the type of content you are sharing, a same day share can either be vital or not entirely necessary. If you are sharing a photography session (wedding, engagement, family etc...) then part of your marketing efforts might be to get that post out as soon as possible to capitalize on the momentum and excitement of the session. So in that instant, sharing it out heavily on the day you publish might be of utmost importance. And I do still think that its always a good idea to share that fresh and newly published content out to all of your social channels, even if you are sharing evergreen content that will be relevant for days, weeks and months in the future. Depending on what social channels you have decided to focus on, there are various ways to share on each platform. Within the blogging function on Squarespace, you can auto share to Twitter, Facebook, Google + and Pinterest right as the blog publishes, so you don't have to in and manually share to each one. Make sure you have a link to your blog somewhere in Instagram as well either through a specific landing page that you link through your profile or by using something like linktr.ee. Taking the time to actually caption your published posts on your social media also makes a huge difference. Give people a reason to go and look at the content, don't just share a "naked" link and hope for the best. Adding additional context and content around the published content shows your passion for what you are sharing and how it can be helpful for others. Another great way to get eyes on your newly published content is through your email list (if you have one). People miss a LOT on social media with all of the current algorithms etc...that are now in place. If people have signed up to hear from you, make sure you are sharing any new or fresh content that you are putting out. Don't assume everyone knows what is going on in your business because trust me...they don't!! Getting our heads around sharing our content well after it's been published can be a little more tricky. Blogging has changed IMMENSELY in the past few years and for a lot of small creative business owners, its really no longer about the daily post and "diary" style of blogging that was so popular even 5 years ago. If your business is NOT your blog, but your business HAS a blog to support your brand and marketing efforts, evergreen content will be of utmost importance to you. The essence of evergreen content means that the date you publish it is irrelevant. So how can you make the most of your content? I'm glad you asked, I've got a few suggestions for you! If you have taken the time to write up helpful content that will serve your clients, share those posts DIRECTLY with your clients. Either in the pre-booking or even in the after booking stage. Likely your clients have lots of questions that you can help them answer. Instead of repeating yourself over and over again in emails, send them links to your blog posts. Don't make them do the hard work of digging through your website to find the info, send it directly to them. One of my biggest pet peeves when visiting a creatives website who has great content is when they have made it super difficult to find or access. So often we as creatives choose pretty design over functionality and its hurting our businesses in the long run. Make things easy to find. Incorporate summary blocks throughout your website in strategic places. Link to popular or helpful posts in your sidebar. Create an easy to navigate archive page. Add a search bar to your website. 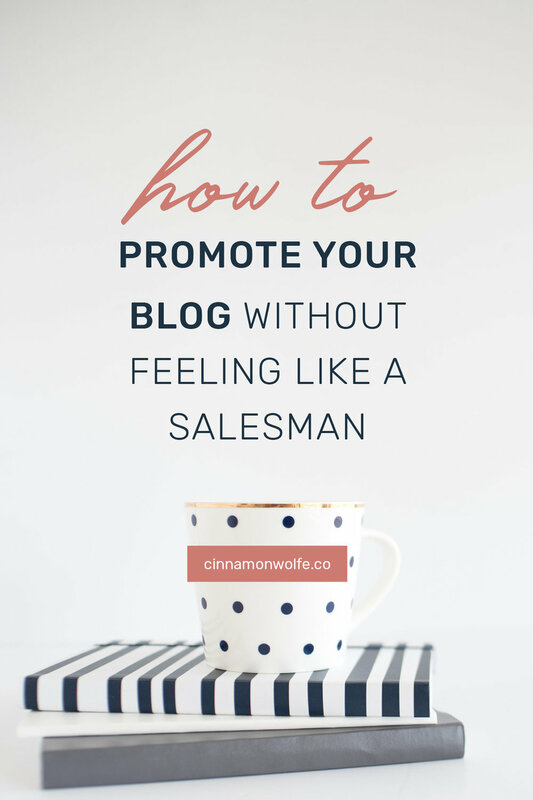 Promote your blog throughout your blog. In every single blog post you should have at least ONE (if not waaay more) links to other blog posts. This is just one more additional thing you can to make things easier for your readers to find or access and will ultimately keep readers on your site longer and help them to know, like and trust you even more than they hopefully already do! Mindset and attitude is everything. Crafting and creating your content in a way that you know will be beneficial to your readers or clients will take away some of the hesitation around posting it. You aren't posting the content in a way that is saying "Look at me" you are posting it with an attitude of "look at them" or "here, this can help". That changes everything and allows you to push that publish button a little easier.